It's a tough job, but Hexis can handle it. Achieve the most astounding visual effects on surfaces you wouldn't expect to - with Hexis super-strength, printable adhesive film. A super conformable and adaptive material for effectively applying decorative graphics to plaster, chipboard, brick, concrete, render, asphalt, and more? You may think it sounds far-fetched, but Hexis has a printable material in their product lines which is specifically designed to handle such assignments. Hexis VCSR100WG1 can be directly applied onto rough, uneven, irregular and low energy surfaces, meaning virtually any indoor or outdoor wall can become a fresh, new medium for visual communication, allowing you to contemplate ingenious ways of exploring graphic treatments. 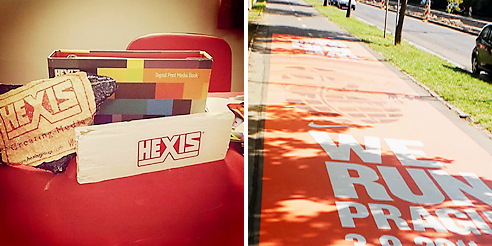 Hexis VCSR100WG1 is a 2mil, cast vinyl film, with a high tack adhesive for perfect adhesion to complex surfaces. Suitable for use with solvent, eco-solvent inkjet printers and certified by HP for use with HP Latex inks, it is available in rolls 1370mm wide x 45m long. The film can be used without laminate, but in order to achieve longer durability, Hexis recommends the lamination of the film with PC30G2 (Gloss) or PC30M2 (Matt) cast laminates. By utilising Hexis' super adaptable, amazingly resilient wall wrap films and laminates, you can simply change the tone temporarily, or permanently transform the function of the most difficult of spaces with no trouble. 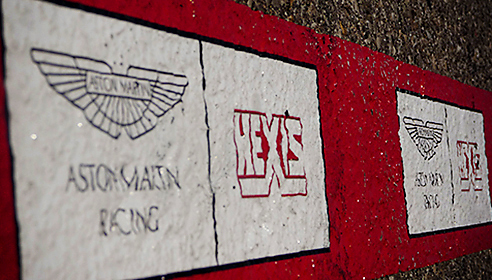 No matter your project, you will find Hexis wall wrap films will come to the rescue in many exceptional situations. For more information and usage specifications, contact PT Store or visit www.ptstore.com.au.